Our 2 X Great Grandfather's - David Lee, in 1851, was married to Isabella Hillson from Melrose, and living in "Leggetts Land working as a Groom along along with children, Andrew aged 15 (apprentice plumber) ; Harriet aged 10 ; David aged 5 ; and John aged 5 month's. I can't pin down the exact date of arrival in Village but Son Andrew was born in 1836 in Coldstream and Harriet was born in 1846 in Midlothian, so it is likely they arrived to settle in Village sometime between these 2 dates. 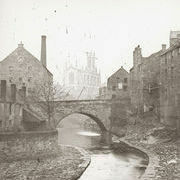 The addresses throughout the Lee Family occupation of the Village (Water Of Leith Village) are as follow's : Leggets Land, No 14 Damside, No 38 Damside, No 1 Convening Court, No 3 Convening Court, No 9 Convening Court, No 28 Well Court, No 37 Dean Path (was where my Dad's family lived as youngster's before moving eventually to Well Court), and Dean Path East Side (think that's the side that Burn's Shop was on), and also Bell's Mill and Dean Orphanage Hospital. My Aunty Mary Marshall was my Mum's sister and the only member of her family, that lived in the Dean residing at No 37 Dean Path.